TMC's optical tables and isolation systems offer industry-leading performance and rigidity thanks to an all-steel construction and the highest core density and smallest honeycomb cell area on the market. CleanTop Performance series have three levels or damping performance as well as a multitude of configuration options for a variety of use cases. Individual tables can even be mechanically coupled in order to create complex rigid table shapes without loss of damping performance. 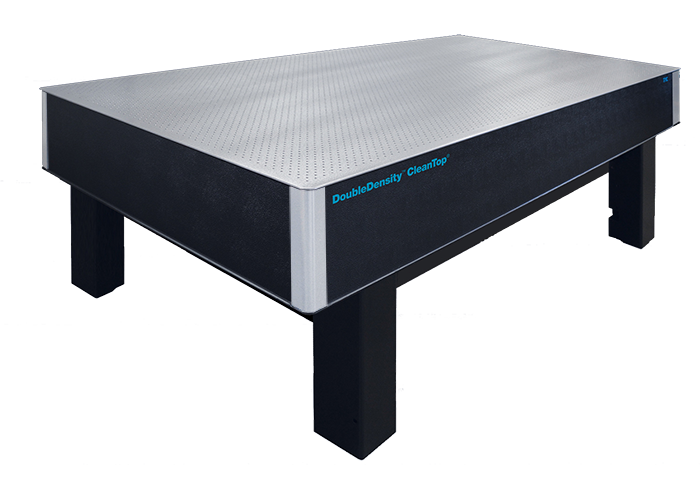 The System 1 optical table support systems (sold separately) have the same configuration flexibility and unparalleled vibration isolation performance. Provides the ultimate in optical top performance. Unmatched in the industry, Research Grade performance combines the smallest cell-size and highest core density with the unique CleanTop® design, all-steel construction, and the highest level of structural damping commercially available. Research Grade CleanTops are recommended for the most demanding applications including interferometers, holography, and ultra-fast lasers, as well as the most severe floor vibration environments. For the best overall vibration control, consider combining this top with a LaserTable-Base™ support, a hybrid air/piezoelectric, 2-stage vibration cancellation system. Scientific Grade has the same design features as Research Grade including core size and density, CleanTop cups, and all-steel construction with reduced damping. Peak compliance levels for Scientific Grade damping exceed peak compliance levels of Research Grade damping by a factor of 4. Provides an economical performance level for the least sensitive applications in less severe floor vibration environments. The Laboratory Grade is appropriate for general lab applications where the primary requirement is for a rigid, flat mounting surface. Tapped holes: Backed by 1 in. (25 mm) long CleanTop nylon cups. Steel cups optional. Research Grade: corner compliance data measures the displacement of the table in response to impact by a calibrated hammer. The lack of response below 300 Hz is indicative of extremely high damping and excellent overall structural performance. Compliance was measured on a 48 x 96 x 12 in. table. Scientific Grade: corner compliance data shows higher peak compliance value than the Research Grade. Compliance was measured on a 48 x 96 x 12 in. table. Laboratory Grade: Corner compliance data shows higher amplification at the table's resonant frequency. Compliance was measured on a 48 x 96 x 12 in. table. TMC has long adhered to the philosophy that dry damping of an optical top is preferable to oil-based dampers. Oil's characteristics can change over time and hidden oil reservoirs are always in danger of being pierced by an end-user customizing his system. TMC optical tops have guaranteed performance levels which are unsurpassed. In addition, with three levels of broadband damping and three environmental choices, TMC offers the most flexibility in choosing a performance level. Guaranteed maximum compliance levels for the maximum damping level are tabulated in the plots below. The standard damping level offers compliance levels a factor of four times higher than those tabulated. The minimum damping level is only recommended for non-sensitive applications. The curves summarize the guaranteed performance levels of TMC optical tops. In addition, table top corner compliance data are presented for the three damping levels available. Data were acquired by impact testing, using a one-pound calibrated hammer, accelerometer, and dual-channel spectrum analyzer. As these examples demonstrate, actual measured performance is often considerably better than our guaranteed performance. CleanTop® optical top and System 1 supports installation steps part 1. CleanTop® optical top and System 1 supports installation steps part 2. CleanTop® optical top and System 1 supports installation steps part 3.